Baby-led weaning hits the ground running, skipping the traditional mushy purees and heading straight for more solid foods. This allows your tot to take the snacky lead – and share the kinds of foods the whole family enjoys eating. It’s a no-extra-meal-prep win-win all ’round! While it may seem like this puts the onus on your child to ensure they’re well fed, it’s really a team effort. The “baby-led” part of this term simply indicates you watch and learn from your baby’s cues, as you continue to feed them via the breast or bottle. Your child needs to be able to sit comfortably and without assistance in a high chair – and move their mouth with up and down jaw movements to self-feed. If your baby still has a “tongue thrust” reflex, pushing any food you put in their mouth straight back out with their tongue, wait a little longer to begin solid foods. 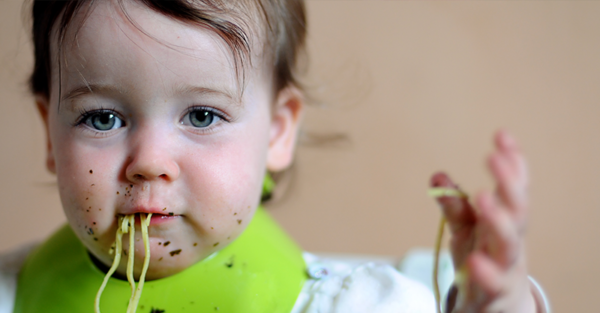 Baby-led weaning refines chewing skills, so don’t worry if things start off a little clumsily! Most babies start the process of baby-led weaning at around 6 months of age and if your baby starts reaching out for the food you are eating, it’s a sign that they may be ready for more than milk on the menu. Breastmilk (or formula) provides all the nutrients your baby needs until six months of age. During baby-led weaning your child will continue to get most of their nutrients from the bottle or breast, until they are at least 10 to 12 months of age, so keep offering those regular feeds! That said, it’s great to choose foods that are high in nutrients and healthy fats as first foods, to provide a boost and start as you mean to go on. It’s going to be a bit messy and that’s okay. Focus on these first steps towards ordering everything on the menu, rather than the peas escaping under the fridge! Keep it positive, praise your baby’s progress and smile through the messy bits. 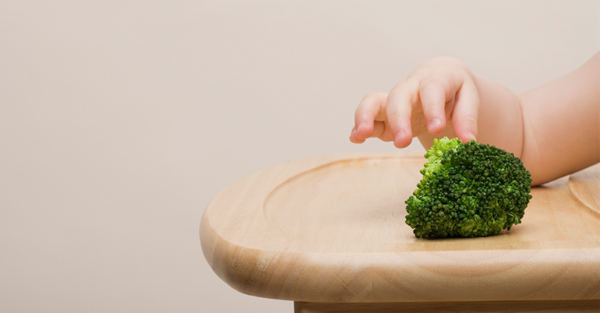 Baby-led weaning is all about independence and DIY-ing, so make sure you offer your little kiddo some nourishing foods they can hold all by themselves. Sliced banana, steamed broccoli, steamed green beans, sliced pear, steamed zucchini, grated apple, sliced peaches and pieces of roasted pumpkin are all good places to start. Better still, begin offering some of the foods your family are eating at each meal. Note that it’s also important to supervise your child while they eat, for safety reasons. There’s all the time in the world to introduce all the foods, so take things slowly and conservatively during these early days. Let your baby develop their own trusty favourite foods and learn to trust the process. It may seem like you’re getting nowhere as you watch your baby fling that handful of zucchini floor wards, but know that you may have to offer the same food four, five, even six times before your baby gets interesting in chowing down. 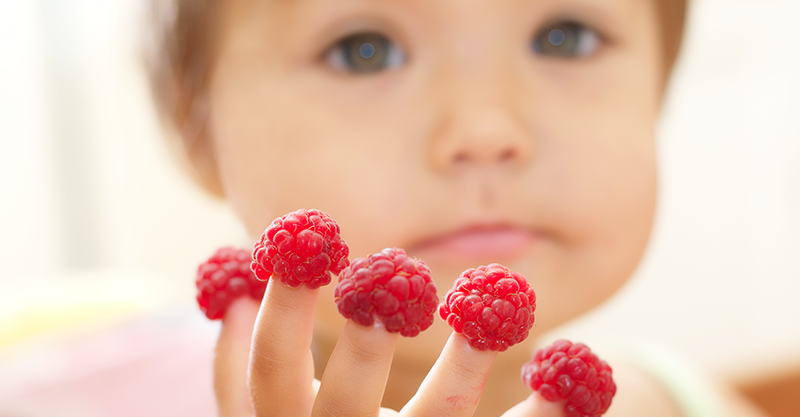 Finger food is a steep learning curve for little taste buds, teeth and tongues, so keep it positive and keep trying! If your baby is consistently rejecting a particular food every single time it’s offered, spitting it out, gagging or even crying, they are trying to tell you something! Put that food aside for now and reintroduce it when they are a little older and may be more accepting or ready. 9. It encourages a love of food – and chomping! Experts say baby-led weaners have fewer fussy food battles than babies that are weaned in the spoon-fed style. Babies also start chewing from the get-go, so there’s no traditional transition from puree to finger food. It’s a delicious kind of skipping ahead. Your baby eats an infant-friendly version of what your family eats, which means shopping and cooking for your baby is just a part of your usual family routine. It’s a total win-win and your family favourites will become your kiddos’ favourites before you know it. Wishing you many happy mealtimes, chasing peas under the fridge, mums and dads!